Single location stores can be challenging at times, and when you start to operate a multi-location supermarket and retail chains, new complications and difficulties arise. Efficient management of these multi-locations is the key with sharing of information and data fundamental to success. Competition is fierce, margins are small within the retail environment, so managing your daily operations between multi-locations is one of the biggest challenges facing the supermarket and retail chain industries. SapphireOne ERP enables multi-locations access to a shared database. This provides a comprehensive range of business wide processes consolidated into a single unified database. The SapphireOne ERP ensures enhanced efficiency, speed and visibility. Sapphire Web Pack POS terminals allow management of business processes from mobile devices or back at the main client server. Unlimited users can have access to certain parts of the live data file from any device with a browser. Inventory, stock control and ordering can be performed onsite saving time and money. With real-time data across the supermarket and retail chains, head office can focus on pricing, inventory management, performance reporting and marketing. Sapphire POS terminal provides users the much-needed flexibility and lifts restrictions on how and when data can be added into the system. Stock can be transferred from one location to another, clients can be invoiced, and vendors paid on mobile devices with a browser. With the SapphireOne ERP application multi-location supermarket and retail chains have access to data from all points of their business. This enables increased operational efficiencies saving time in purchasing and replenishment through better planning and reduced costs. 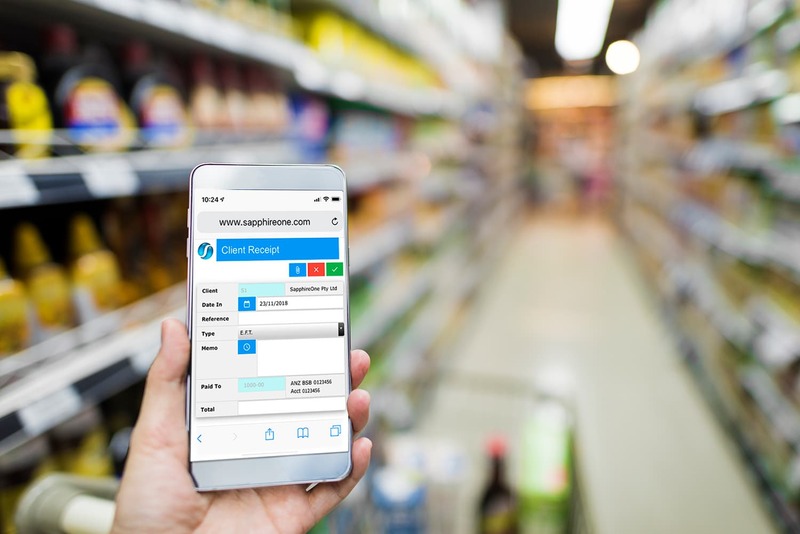 The SapphireOne ERP application allows multi-location supermarket and retail chains operating in multi- locations the ability to increase and enhance operational efficiencies by managing within the one application. Total visibility at head office ensures improved reporting, planning and greater financial control of your business. SapphireOne ERP Payroll/HR module seamlessly manages employee data and payroll information allowing head office to set up pay periods, track history and administer employee history through the easy to use interface. The ERP software ensures sharing of information with employees, management and HR, helping management make executive decisions on job assignments and how to improve performance. Some of the features of SapphireOne Payroll/HR include modifying an employee, class, inquiry, award entitlements, leave, remuneration inquiry, allowances, tax, scales, reports, ATO’s Single Touch Payroll and employee benefits. An effective sales process and customer management software equates to greater revenue. SapphireOne ERP, CRM, DMS Business Accounting Application combines integrated business processes with CRM software allowing marketing to focus efforts on maximising sales and reaching out to new and existing customers. Our ERP, CRM software helps business engage with customers, provide insights, improve efficiencies and ultimately increase sales. For more information regarding improvements and features within the latest release of SapphireOne ERP Business Accounting Application please contact our office on (02) 8362 4500 or request a demo.